This is what The Buzz is all about! 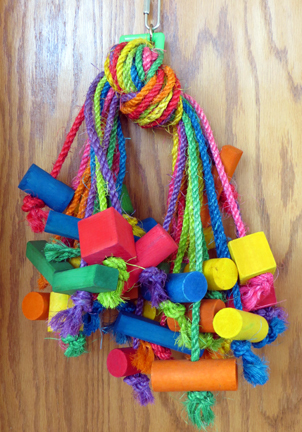 Lanky colorful, sisal legs with chunky, chewable wooden pieces on the ends. This is a great toy for those birds that love to tongue and chew on sisal. The large wooden parts should keep some of your large beaks very happy!! There is a heavy duty plastic shape on top with a nickel plated quick link for easy hanging and great for most of the larger sized beaks in your house!